Bumgenius laundry detergent is perfect for your cloth diaper care. bumGenius Laundry Detergent was developed in partnership with Country Save, a well recognized, respected face in the cloth diapering industry, and was specifically designed for use with cloth diapers. 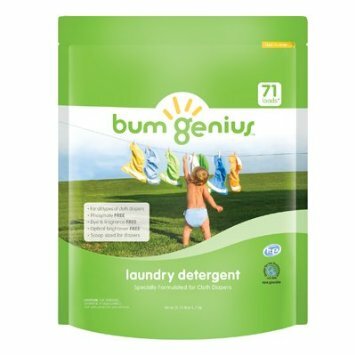 bumGenius Laundry Detergent is professionally formulated, free of dyes, optical brighteners, fragrances, enzymes and phosphates. There are 71 HE / 35 normal loads per box. The scoop has been specially designed for cloth diapers (no guessing, just follow the directions). Our detergent can be used on any laundry and is certified for use in HE washers. USAGE NOTE: Scoop is sized for normal water conditions. Actual use may have to be modified based on your water type, the age of your child and the condition of your diapers. Use more detergent if you have hard water. Be sure to wash diapers every other day. For best results, rinse poopy diapers using the bumGenius Diaper Sprayer.